O Bon is the Buddhist festival that venerates lost relatives and ancestors and takes place this week in Japan. Spirits of loved ones are invited home to spend time with family- food offerings are made at home and temples. For many in Japan, O Bon is a valued time to spend with family-many taking a break from work and returning to their hometowns. Family members visit the graves of their loved ones- washing and cleansing the gravesite. Glowing lanterns line the homes and streets to guide the ghosts of loved ones home. 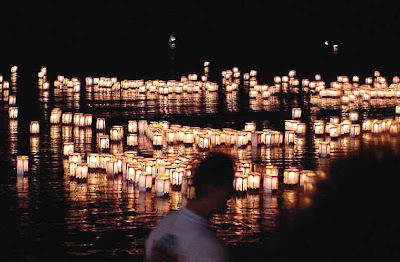 The last night of O Bon ends with Toro Nagashi (floating lanterns) and the lanterns are released into a body of water to guide the ghosts back into the spirit world. Bon Odori (folk) dances are very popular during the festival. Dressed in Yukata, (summer kimonos) people dance to the music of drums and flutes. Fireworks are also very common during these festivals. If you can take the August humidity, O Bon is one of the most beautiful times to visit Japan and experience the culture, religion and beauty! More Final Fantasy VII 10th Anniversary Items!! Special Edition Batman Comics Shoes! A Rinkya Blog's New Feature Collector's Corner! 30 Years Later- Star Wars Technology Hits Japan! Pizza Hut Creates Japan's Favorite Pizza! Nintendo Wii Fighting Stick Arcade Controller! Enter Rinkya's Japan Weird Food Contest!! Cute Cell Phone Straps Direct From Japan! Japan Gadgets Protect Against Global Warming! Go Green with The Frog Can Crusher from Japan! Extreme Ironing Japan on Mt Fuji! Wacky Sports! Protect Your Nuts! The Japanese Game Show! No More Sweat At Work- Plug in the USB Tie Fan! T-Qualizer- Watch your Shirt Jam to the Music! Final Fantasy VII Sony PSP Special Edition! Gundam Invades the Fashion World! New Kit Kat Flavor Added!